This page is for prayer profiles for various countries, regions, or people groups. Click the link to view and print or save the files. To download the files, right-click on the link and select “save target as“. The Aceh Province was one of the hardest hit areas in the December 26, 2004 tsunami. Click here to view. 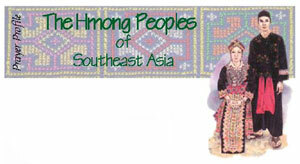 This is a profile of the Hmong Peoples of Southeast Asia. Click here to view.